Typical Dutch Souvenirs - Dutch gift shop - www.typical-dutch-giftshop.com | worldwide shipping. The General Terms and Conditions of www.hollandse-souvenirs.nl are valid for every use of the webshop. By placing an order through our webshop, you declare that you agree with its contents. This webshop is part of Typical Dutch. Any natural person or legal entity that comes into contact with the webshop about the conclusion of an Agreement. Every agreement that is made between the webshop and the Buyer, any change thereto or addition thereto, as well as all legal acts in preparation and in execution of that agreement. The services to be provided by the web shop, whether or not related to the products, including advice, assembly and service in the broadest sense of the word. Every order from the Buyer to the webshop. Orders are only accepted by the webshop, if they are placed via the webshop. 2.1. By placing an order via the webshop, buyer indicates that he agrees with the conditions. The webshop has the right to change its Terms and Conditions and their content after expiry of the term. 2.2. The webshop ensures that the order is executed after receipt of payment to the webshop. The ordered products are delivered to the buyer, the shipping costs being the responsibility of the buyer and the risk of shipping for the webshop. 2.3. The webshop is authorized to use third parties for the execution of the order. 2.4. The webshop is entitled to refuse the buyer access to the webshop without stating reasons. 3.1. All offers of the webshop are free of obligation and the webshop explicitly reserves the right to change the prices, in particular when this is necessary on the basis of (legal) regulations. 3.2. An agreement is only concluded after the buyer has provided all the information requested by the webshop and the webshop has confirmed the order by means of an e-mail to the e-mail address specified by the buyer. The Buyer must report any inaccuracies in the order confirmation to the webshop immediately upon receipt, failing which the order confirmation will be deemed to correctly reflect the agreement. 3.3. The webshop is entitled to refuse orders motivated or to attach special conditions to the delivery, unless expressly provided otherwise. If an order is not accepted, the webshop will inform you within ten (10) working days after receipt of the order. 4.1. The prices stated for the products and services are in euros and include sales tax (VAT), unless expressly stated otherwise. The (purchase) price due by the buyer and additional costs for VAT and shipping costs are clearly stated in the order confirmation and invoice of the webshop. 4.2. All prices on the webshop are subject to printing and typing errors. No liability is accepted for the consequences of printing and typing errors. 4.3. Payment of an order is done through: iDEAL, Paypal, credit card or prepayment. Further (payment / order) conditions can be set for the order. In case of payment by bank or giro the date of payment is the date of crediting the giro or bank account of the webshop. 4.4. The webshop reserves the right not to offer one or more of the aforementioned payment options, for a definite or indefinite period. 4.5. The Buyer is entitled to cancel an order (up to the period of dispatch) or to dissolve the agreement in accordance with the statutory provision regarding distance selling. 5.1. Orders paid via iDEAL, Paypal and credit card and placed before 16.00 on weekdays on the webshop, are sent within 24 hours, if available. We are not responsible for delays at DPD, Post NL and due to, for example, Christmas rush. Orders paid via bank or postgiro are sent as soon as payment has been received by the webshop. 5.2. The delivery period stated by the webshop is only indicative. Exceeding the delivery period does not give buyer the right to compensation or the right to cancel the order. If the delivery time is exceeded, the buyer will be informed by e-mail, in writing or by telephone about the expected delivery time, whereby the webshop must be given a maximum period of 14 days to still perform. In accordance with the legal conditions, the buyer has the right to cancel the contract free of charge. In that case, any payments will be refunded to the buyer as soon as possible, but within a maximum of 14 days after notification. 5.3. The webshop sends the products with DPD or Post NL or unless the buyer has indicated to pick up the order during the checkout process on the webshop. If the buyer chooses to pick up the order, no shipping costs will be charged. 5.4. Typically Dutch do not deliver in a mailbox. 5.5. The webshop sent to all products all countries. Flower bulbs and alcoholic beverages are an exception. 5.6. If you have chosen a DHL Parcel Shop, if the product is not collected within 7 days, the product will automatically be returned to the sender. 5.7 If a package reaches a foreign pickup point and is not claimed, the package will be returned (at the expense of Typically Dutch) and the value of the contents of the package will be refunded to you. This always with the same means as with which the purchase was made. There is a fixed rate including VAT. 8.1. The webshop guarantees that every product delivered by it meets the normal requirements of soundness and usability. • if damage is caused by intent, gross negligence or negligent maintenance. 9.1. If the buyer believes that the delivery does not comply with the agreement, the buyer has the choice to replace this delivery with a new delivery upon return thereof, within fourteen (14) days after delivery of the order. 9.2. The article must be returned to the webshop in the original packaging and in its original state with a copy of the purchase invoice. As soon as the product is received in good condition with a copy purchase invoice by the webshop, the purchase price of the product is transferred to an account number specified by the buyer. 9.3. The shipping costs for returning the product are at the buyer's expense. 9.4. The return form must be completed and sent with you. The form can be found under the heading contact. The risk of loss or damage to items that are the subject of the agreement will pass to the buyer at the time the goods are presented for receipt and received at the specified address. In the event of the discovery of a defect, the buyer must report this to the webshop immediately upon receipt of the products. The costs of return shipments in the event of a defect are at the expense of the webshop. The ownership of the delivered products and / or services will only pass to the buyer if the buyer has paid all that he owes to the shop on the basis of any agreement. The risk with regard to the products already transfers to the buyer at the moment of delivery. 12.1. Without prejudice to the other rights accruing to the webshop, in the event of force majeure the webshop has the right, at its own discretion, to suspend the execution of the order, or to dissolve the agreement without judicial intervention, such as this by informing the buyer in writing. and without the webshop being obliged to pay any compensation, unless in the given circumstances by standards of reasonableness and fairness would be unacceptable. 12.2. Force majeure means any shortcoming which can not be attributed to, because it is not due to her fault and not under the law, legal act or generally accepted for its account. Force majeure means any circumstance that is independent of the webshop, which means that the fulfillment of its obligations towards the buyer is prevented in whole or in part. These circumstances include strikes, fire, business failures, power failures, disruptions in a (telecommunications) network or connection or used communication systems and / or the unavailability of the web shop at any time, non-delivery or late delivery by suppliers or other third parties engaged and the absence of any permit to be obtained through the government. 13.1. If the buyer gives an address in writing to the web shop, the webshop is entitled to send all orders to that address, unless the buyer gives written notice of a different address to which the order should be sent. 13.2. If during the short or longer period of time the website authorizes deviations from these conditions, whether or not tacitly, this shall not affect its right to demand immediate and strict compliance with these conditions. Buyer can never assert any right on the grounds that the webshop applies these conditions smoothly. 13.3. If one or more of the provisions of these terms and conditions or any other agreement with the web shop should be in conflict with any applicable legal provision, the relevant provision will lapse and will be replaced by a new legally permissible comparable by the webshop. provision. 14.1 All rights, obligations, offers, orders and agreements to which these conditions apply, as well as these conditions, are exclusively governed by Dutch law. 14.2. All disputes between parties will only be submitted to the competent court. Order Dutch souvenirs ? Typical Dutch has Delftware , Clogs , Windmills , Tulips , Ladies bags , T-shirts and of course s troop waffles . We deliver worldwide. Maybe you are looking for some smaller souvenirs ? Take a look at the categories Souvenirs , Magnets , Key rings , Coasters , Shot glasses , or the discount bags nuggets . We also always deliver these always packed in Delft Blue paper the next working day . The customer service of the webshop is available from Monday to Friday from 10.00 to 16.00.
the minimum duration of the distance contract in case of an agreement that extends to the continuous or periodic delivery of products or services. If the consumer has accepted the offer electronically, the entrepreneur will immediately confirm electronically the receipt of the acceptance of the offer. As long as the receipt of this acceptance has not been confirmed, the consumer can dissolve the agreement. If the entrepreneur has committed himself to supplying a series of products or services, the provision in the previous paragraph applies only to the first delivery. When purchasing products, the consumer has the option to terminate the contract without giving any reason within 14 days. This period starts on the day after receipt of the product by or on behalf of the consumer. If the consumer does not have a right of withdrawal, this can only be excluded by the entrepreneur if the entrepreneur has clearly stated this in the offer, at least in time for the conclusion of the contract. Contrary to the previous paragraph, the entrepreneur can offer products or services whose prices are subject to fluctuations in the financial market and where the entrepreneur has no influence, with variable prices. This link to fluctuations and the fact that any listed prices are target prices are mentioned in the offer. b. the consumer has the authority to cancel the agreement by the day on which the price increase takes effect. The entrepreneur warrants that the products and / or services comply with the agreement, the specifications stated in the offer, the reasonable requirements of soundness and / or usability and the legal provisions existing on the date of the conclusion of the agreement. / or government regulations. An arrangement offered by the entrepreneur, manufacturer or importer as a guarantee does not affect the rights and claims that the consumer can enforce against the entrepreneur in respect of a shortcoming in the fulfillment of the obligations of the entrepreneur by virtue of the law and / or or the distance contract. With due observance of what is stated in article 4 of these general terms and conditions, the company will execute accepted orders expeditiously but no later than 30 days, unless a longer delivery period has been agreed. If the delivery is delayed, or if an order can not or only partially be executed, the consumer will receive notification no later than one month after placing the order. In that case, the consumer has the right to terminate the contract without penalty and the right to any compensation. If delivery of an ordered product proves to be impossible, the entrepreneur will endeavor to make a replacement article available. At the latest at the time of delivery, it will be stated in a clear and comprehensible manner that a replacement item will be delivered. For replacement items right of withdrawal can not be excluded. The costs of return shipment are for the account of the entrepreneur. The risk of damage and / or loss of products rests until the moment of delivery to the consumer at the entrepreneur, unless expressly agreed otherwise. A contract that has been entered into for a definite period has a maximum term of two years. If it has been agreed that the distance contract will be extended if the consumer is silent, the agreement will be continued as a contract for an indefinite period and the notice period after continuation of the agreement will be a maximum of one month. Insofar as not later agreed, the amounts due by the consumer must be paid within fourteen days after delivery of the good or in case of an agreement to provide a service, within 14 days after issuance of the documents relating to this agreement. The complaint is then sent to both the person concerned and the web shop owner. Disputes between the consumer and the entrepreneur about the conclusion or performance of agreements with regard to products and services to be delivered or delivered by this entrepreneur, subject to the provisions below, can be submitted by both the consumer and the entrepreneur to the Dutch legislator. . The dispute must be submitted in writing to the Disputes Committee no later than three months after the dispute has arisen. When the consumer wants to submit a dispute to the Disputes Committee, the entrepreneur is bound by this choice. If the entrepreneur wishes to do so, the consumer will have to make a written statement within five weeks after a request made by the entrepreneur in writing, whether he wishes to do so or whether the dispute should be handled by the competent court. If the entrepreneur does not hear the choice of the consumer within the period of five weeks, then the entrepreneur is entitled to submit the dispute to the competent court. The Disputes Committee decides under the conditions as set out in the rules of the Disputes Committee. The decisions of the Disputes Committee are made by way of binding advice. The Disputes Committee will not deal with a dispute or will discontinue the proceedings if the Entrepreneur is granted a moratorium, has become bankrupt or has actually terminated his business activities, before a dispute has been dealt with by the Committee at the hearing and a final ruling has been pointed out. 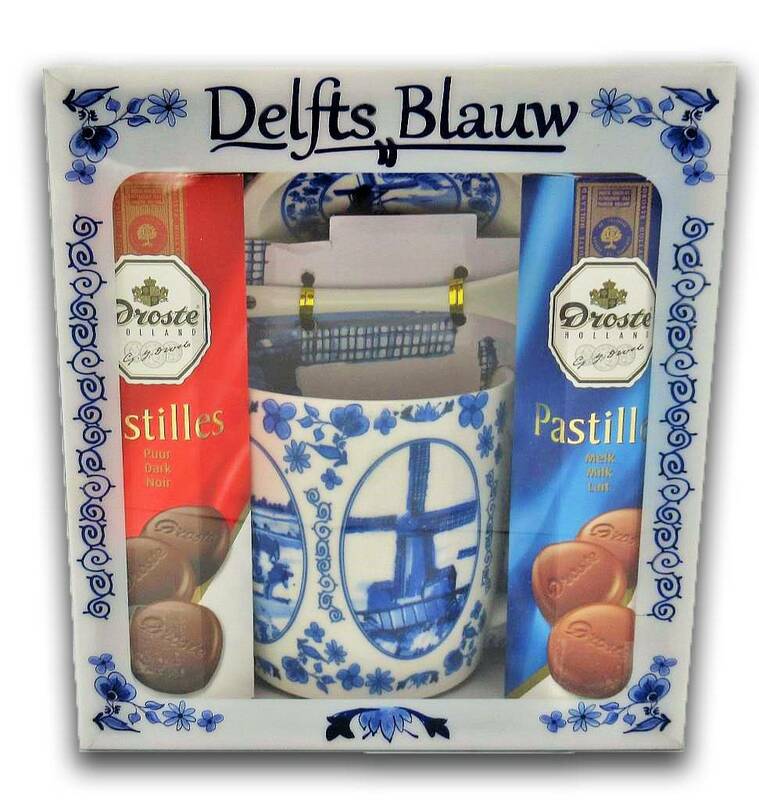 Typical Dutch Gifts and Souvenirs , offers an amazing assortment of traditional and modern Dutch Souvenirs , Amsterdam Gifts and Delft Blue gifts. Our physical and online collection is very diverse and varies from classic Dutch T-shirts, Amsterdam T-shirts , Amsterdam and Holland caps Amsterdam hats , to modern bags by the brand Robin Ruth . Traditional Typical Dutch delicacies such as old-fashioned (nostalgic) sweets, cookies, syrup waffles , Typically Dutch is also the address for Holland gift packages and Holland promotional gifts All souvenirs gifts can be sent during your ordering process to another delivery address such as friends, relatives, or business relations, wherever they are.